" I am invigorated by fresh beginnings and love stories. The prospect of planning an adventure elates me and is influenced by the 10 years I lived in Europe and summers spent on my grandparents' farm in Sweden, digging up new potatoes and strawberries. I dream of cobblestone roads, bakeries, and geraniums in terra cotta pots. I am equally happy going out for a spicy bowl of pho with my husband, or searching Bon Appetit magazine for a recipe to make at home. I believe that it's always a good time for cupcakes. On the weekend, you might find me at the Portland Farmer's Market with a bunch of peonies in hand, or putting a few good miles on my running shoes. I believe photographs are a medium through which we can appreciate the dearest things in life. Your photographs will express a wholesome sincerity and simple joy. I see things straight to the heart and creating a remarkable photography experience for you that is natural and fun is my delight." What is the history behind this piece? 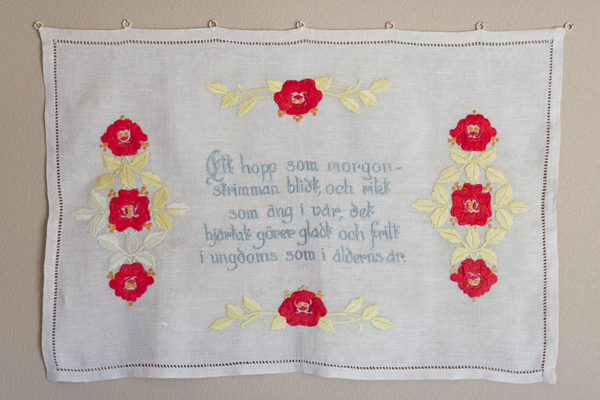 This wall hanging was handmade by my Mormor's (maternal grandmother's) mother in the Skåne region of Sweden almost 100 years ago. My mom gave it to me after I graduated from college in 2007. I love the bright red flowers and the words embroidered onto it. Translated, the message is an uplifting one that echoes a true wish for my husband and I: "A hope that tomorrow shines mild and right, and that your heart is glad and free in youth and old age alike." It is meaningful to me that I am able to showcase a part of my family history in my home. 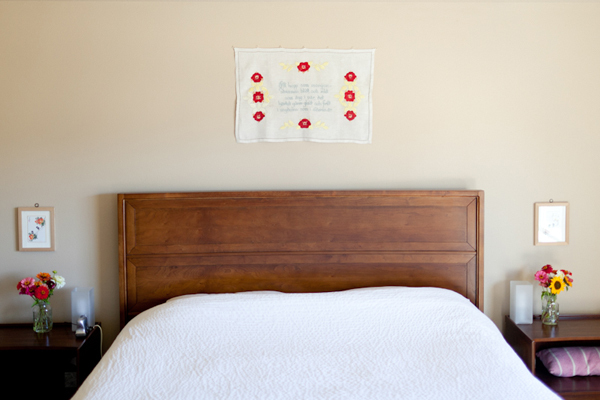 I love to style this embroidered wall hanging over my bed. I can't imagine it anywhere else. There are tiny loops sewn intermittently into the top, so it's easy to iron and hang in place. 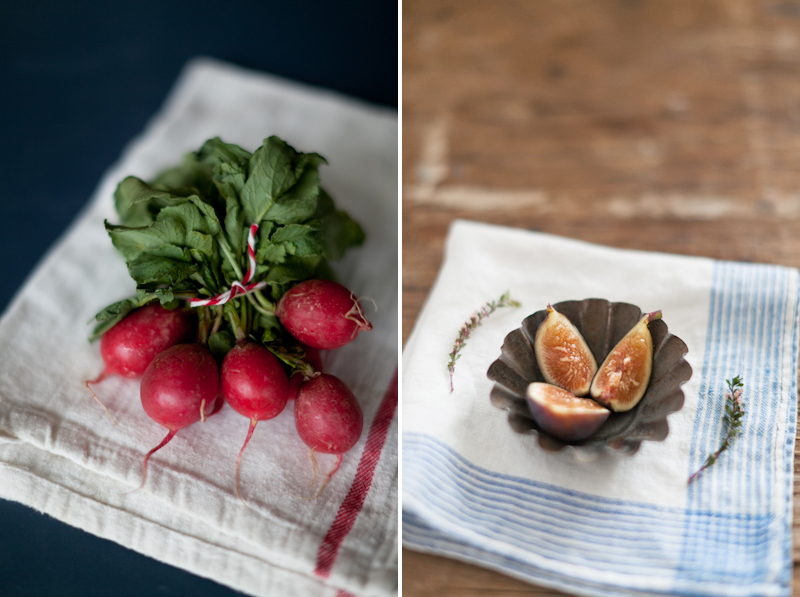 I draw inspiration from meals shared with family and friends, and peace at home. 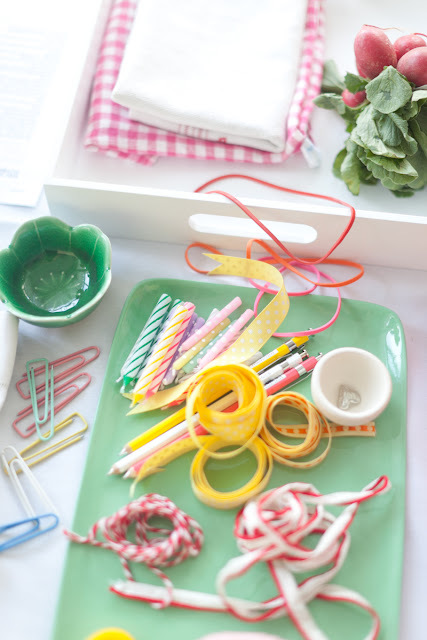 I love reading magazines, cookbooks, and blogs to get ideas going for future projects. I spent most of my childhood in Europe, and draw inspiration from my memories riding trains, traveling with my family, experiencing different cultures, and dreaming of future adventures! My job as a wedding photographer is an extension of my experiences and inspiration. Pictures are a fantastic way to appreciate people and memories, and I recognize joy, strength, and love in the relationships I photograph. Every time I talk to my mom on the phone, she begins her goodbye saying "take care of each other." I truly think this is the best advice I have heard. Of course, it is most importantly applied to the people you are closest with, but I see it as an outward attitude I try and spread outward to my environment; the clothes I wear and the home I live in. It means to take care of the people and things you are blessed with in your life. To look after each other is to love in a tangible and actionable way. Truly my mom is the heart of our family and I draw so much inspiration for my own life from the beautiful, strong, and simple way she lives hers.